Small Metal Stars With Hanging Options, 3"-7"
How Do I Paint My Barn Star? What's The Meaning Of Barn Stars? Paint Your Own Barn Stars! 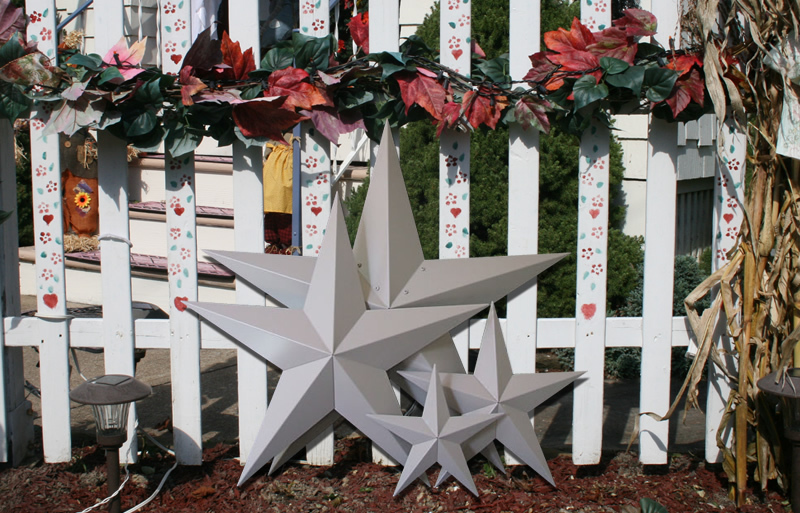 With these primed Amish metal barn stars you have the freedom to let your creativity take charge. Paint your own Americana metal stars, patriotic stars, or even simple solid color stars to match your home decor. The possibilities are endless. You've got the barn star art ideas... We've got the primed stars! These metal barn stars are covered with an Industrial strength gray primer and ready for you to paint or decorate upon arrival for your metal stars decor. Sometimes known as tin barn stars but our HEAVY DUTY metal stars are not made from cheap thin tin. You've seen the cheap tin barn stars in stores and when you pick them up you can feel how flimsy they are. Our stars are NOT like those made of thin tin metal stars. 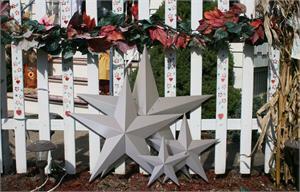 Our barn stars are made by the Amish here in Ohio and made from HEAVY DUTY 22 gauge metal with a galvanized coating. This means NO RUST running down the side of your house over a period of time from the back of the star! Use these barn stars to create a really unique design in your home decor. You can use stencils, decals, your walls for metal wall stars, create your own barn star art and paint them the color of your choice. Let your imagination run wild! Quick and easy assembly for 32" and larger stars to save you a lot of money on shipping. Galvanized metal is specifically treated and will not rust! Industrial strength primer with quality in mind. All stars come with a welded hang tab on the back to aid in hanging. 22 gauge metal (thickness of a dime). Ready to paint with your latex or oil base paints. All stars are measured left to right (tip to tip) and handmade therefore approximate. Hang tabs are standard on all stars to aid in hanging. We also provide vinyl siding hooks. A quick easy solution to hanging your metal barn stars and other decorative items. Prompt personal service contact, email, TOLL FREE 1-877-229-8488. Amish and handmade items made in the USA. 30 Day guarantee and return policy. Well, I put the Star together and found the hanger and it looks great on my barn. Much better quality than the stars sold in gift and craft shops.